Disclosure- I will receive the same for posting this information and giveaway. All opinions are my own and honest. For more information, see “I Disclose”. Are your children excited to see the new Ice Age movie? My son is, he loves the whole line of movies. He’s watched each of them a million times- I don’t know what it is about that squirrel and his nut, but he laughs like crazy every time he sees it. After the movie, you will want them to get all those kernels out of their teeth, and what better way then with an Ice Age themed Phillips toothbrush? 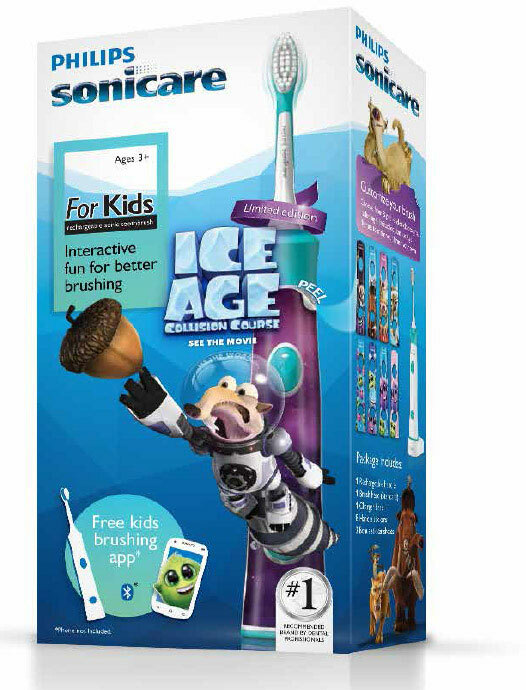 The NEW limited edition Philips Sonicare For Kids Ice Age power toothbrush with Bluetooth® wireless technology and interactive coaching app helps connect children ages 4+ to a lifetime of healthy habits. From the #1 dental professional recommended power toothbrush brand in the US, this breakthrough and fun toothbrushing experience helps motivate children to brush independently – while delivering oral care results that parents can feel good about, too. For a limited time, Philips Sonicare For Kids will feature beloved characters from Ice Age: Collision Course, the fifth installment of the hilarious Ice Age film series. Available at Philips.com, Drugstore.com, Amazon, Walmart and others; download the Philips Sonicare For Kids app in the Apple and Google Play app stores. Check out this trailer for the film! I would give this to my youngest daughter ! i would give this to our son. he would love it. i would give it to my niece. she is a huge fan of the movie! this will go to my son he will love it!! I would give this to my daughter! she loves frozen . It would go to a grandchild, final decision to be made later! I want it for my grandson! I will give this to my youngest nephew to encourage his brushing. Thank you for the fun giveaway. I would gift this to my son. He would love this and it would make brushing fun. I will be giving this toothbrush to my nephew. This will be for my oldest son. He will really enjoy this! Oh this would be for our little one! He loved the movie, and I think this would make brushing so much fun for him! I would love to give this to my little girl. I will give this to one of my girls! It would be perfect for my middle granddaughter. My son could really use it he has Celiacs disease which ruins your enamel on your teeth. my son – totally needs it! My nephew. He would use a toothbrush more often with no complaints I think. I would give this to my son, it would be terrific for him to use. I love Sonic toothbrushes. U’d give it to my son. I’d love to win this for my 8 yoa niece, Imani. Thanks.